There is more than one way to play Chaos! You can choose from our game types by activating the Chaos mod itself, or you can choose to use our mutator – just about anywhere! 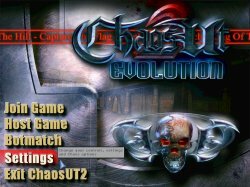 Chaos has been designed (intentionally, and with great effort) to be as flexible and as compatible as was reasonably possible, with anything and everything available for UT2004. This is also why we have provided a mutator version of our mod. 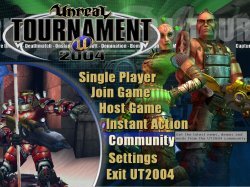 Simply so that Chaos can be played and enjoyed in ALL standard UT2004 game types, in addition to most custom game types, and even when combined with many other mods or mutators. 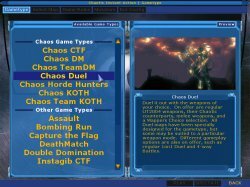 However, Chaos also comes with it’s own complete game types, each with full bot support, and each fully functional in online play. But it is important to note that some Chaos features (ie: melee weapons) are only available through the Chaos game types! 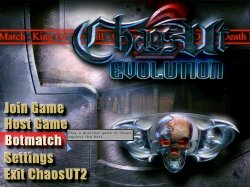 Chaos can be played in any standard gametype, simply by using the ChaosUT2: Evolution mutator. 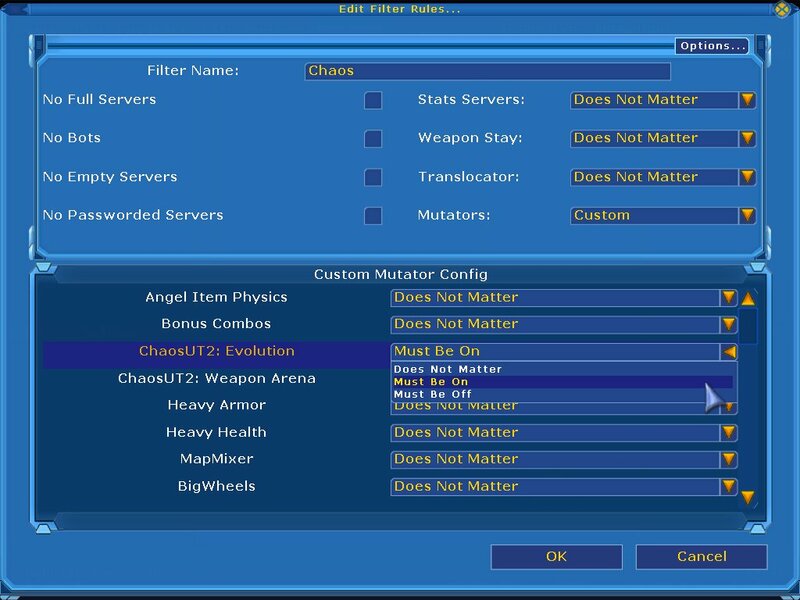 Just go to your mutator selection screen, and in the ‘Available Mutators’ window on the left, double-click on the ChaosUT2: Evolution mutator to move it to the ‘Active Mutators’ column on the right. This will allow you to use the Chaos weapons and items on ANY STANDARD UT2004 MAP, and ANY UT2004 GAMETYPE.This one mutator will cause certain weapons to rotate between standard UT2004 weapons, and the new ChaosUT2 weapons, every 30 seconds or so. It will also enable the various other features of Chaos. Then simply click ‘Play’, and Enjoy! 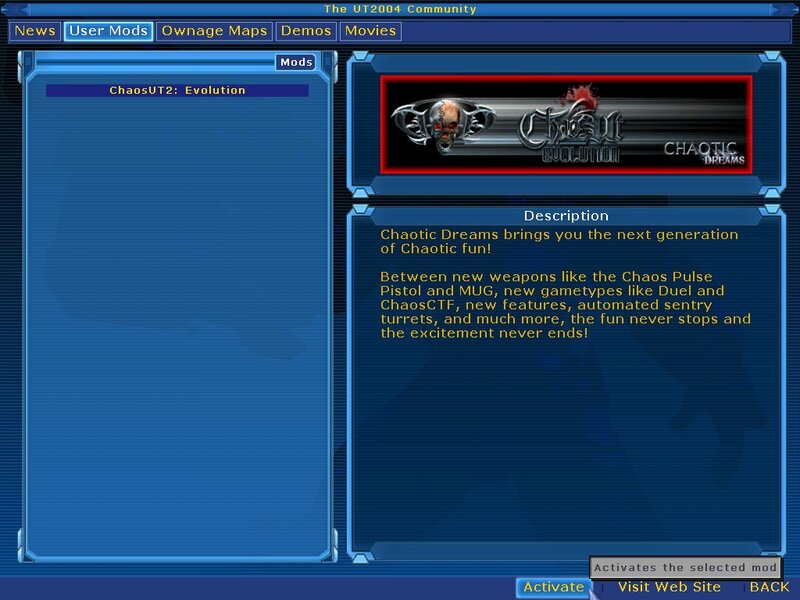 The 2nd Chaos mutator listed is called ChaosUT2: Weapon Arena. 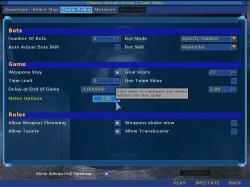 This mutator works like the normal Arena mutator that shipped with UT2004 (ie: it replaces all weapons and ammo on a map with a single type), only this version also allows you to choose from the alternate ammo types available for some Chaos weapons. 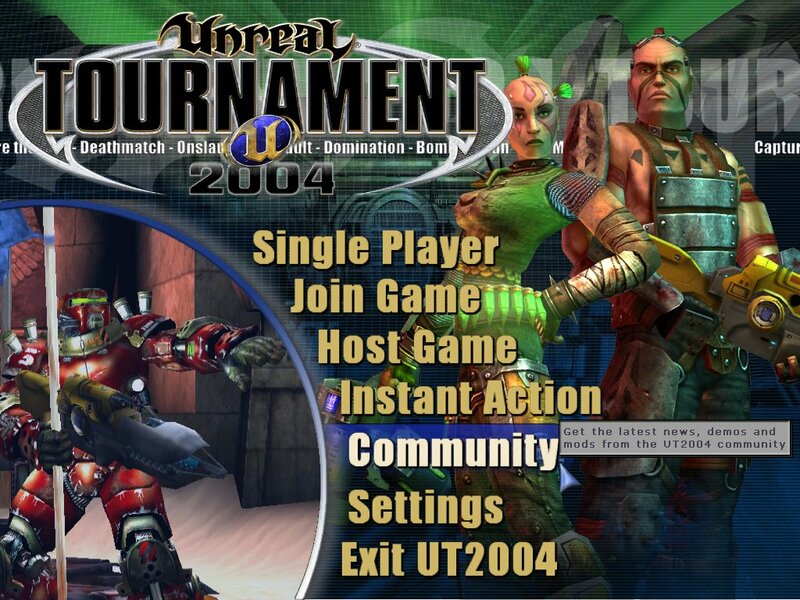 Or, if you are not using a Chaos shortcut, then you can select the ‘Community’ tab in the main UT2004 menu. 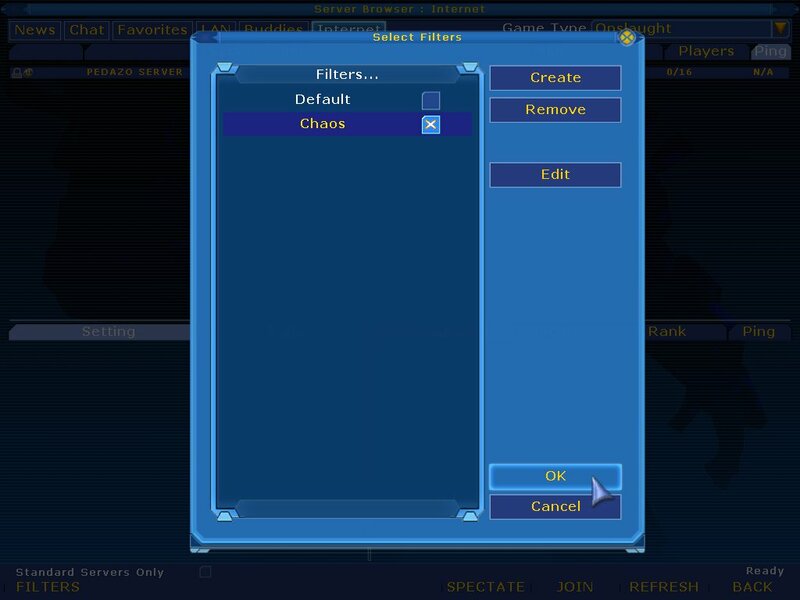 Under the ‘User Mod’s tab, you then select Chaos and hit the ‘Activate’ button on the bottom of the screen. 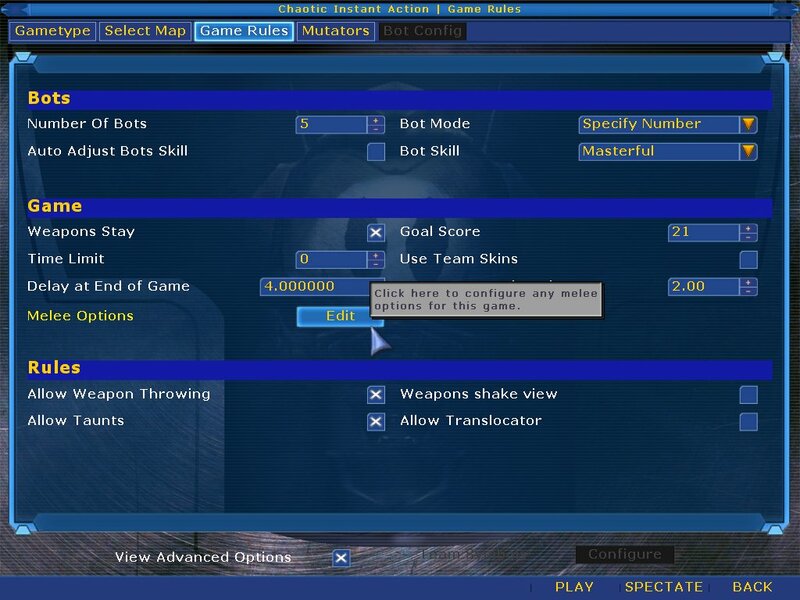 You may then select Botmatch to start an offline game with bots. 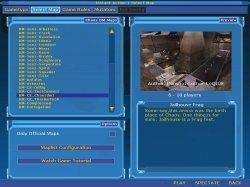 There are Chaos game types available, and all of them have bot support for offline play. 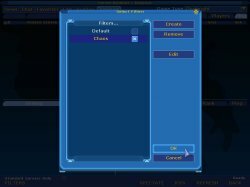 When starting a botmatch in this method you do not need to add the Chaos mutator, as all of the features in the mutator are automatically loaded into the Chaos game types. Note: For design reasons the Duel game type loads without features such as the grappling hook, and gravity belts. To add these features to your Duel games, simply add the Chaos mutator. 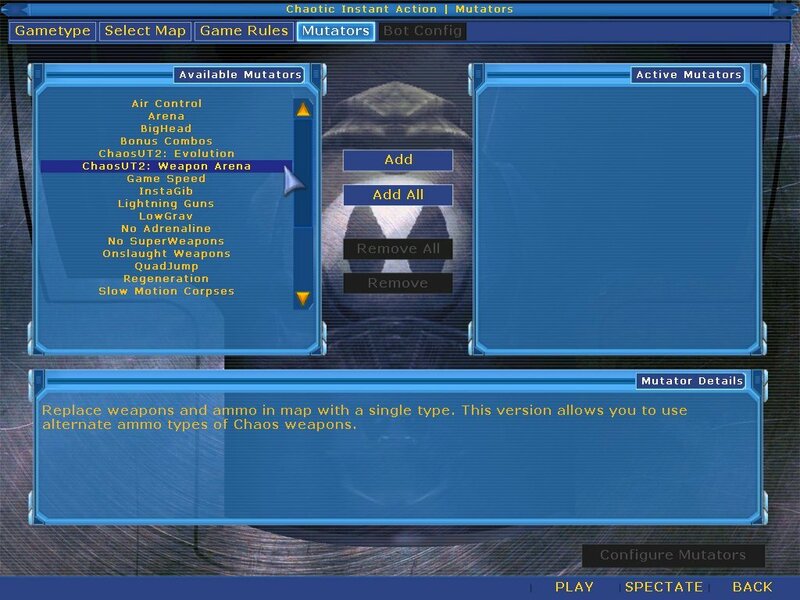 From here you can select any of the Chaos game types from the Game Type menu. Then hit the Select Map tab, and all the maps you have installed matching that game type will automatically be displayed (both Chaos and non-Chaos maps will be listed). 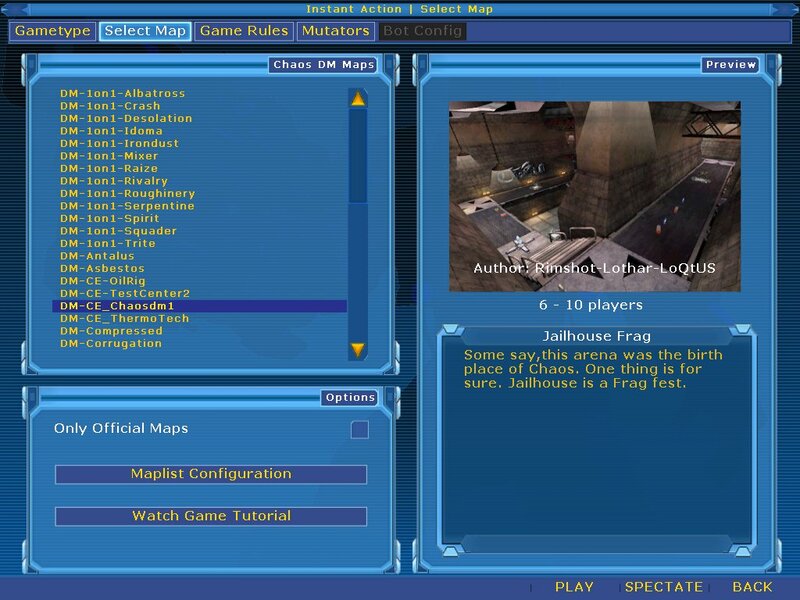 Select the map you wish to start with, set up your map list, and then proceed to the Game Rules tab as you would with any standard game type. There will be settings specific to each Chaos game type under the Game Rules tab. For example, as pictured to the right, when you start a game of ChaosDM, ChaosTDM, KOTH, or TeamKOTH, you will see a new “Melee Option” button available. With this, you can choose to have a melee only game, and if you wish, you can set the melee weapons to “insta-gib” damage. For more details on new game rules/options, refer to the various game type sections of this manual. 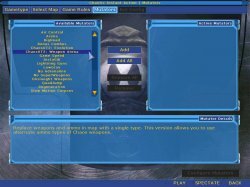 There are a number of ways to find Chaos servers online. 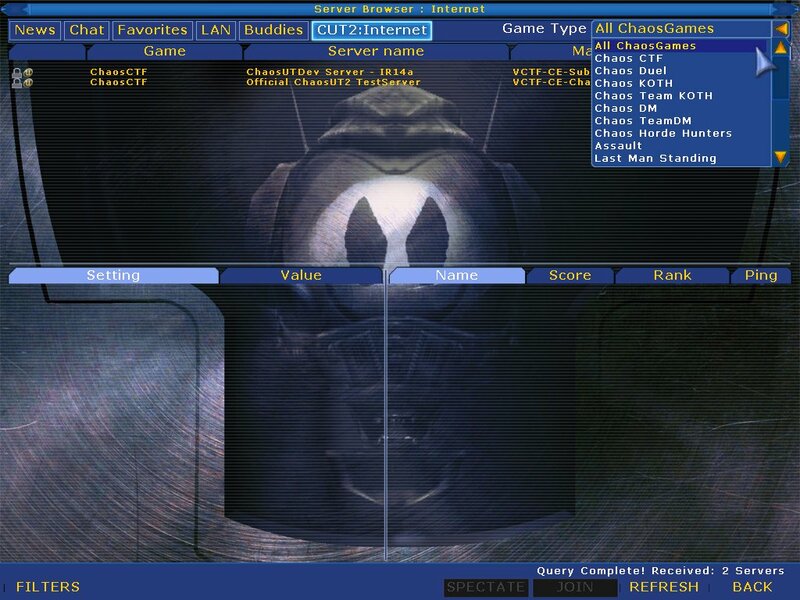 Perhaps the easiest way is to check the Servers page of the Chaos web site and/or the Chaos forums, and then simply adding the server IPs to your favorites list. There are of course other methods available in-game, and you can use whichever works best for you. 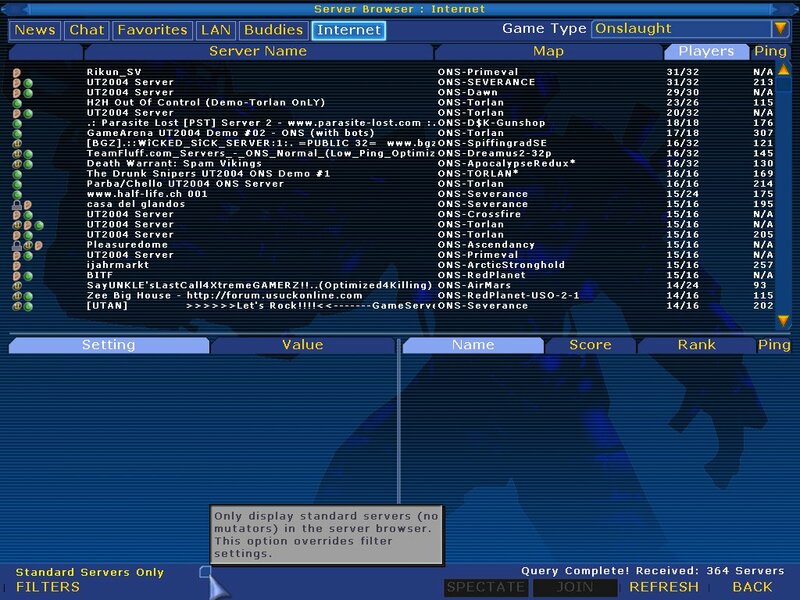 If you are starting UT2004 in the normal manner, and you like to play mods or mutators, it is important that you uncheck the Standard Servers Only checkbox in your browser window!! This will allow you to see all of the many various servers out there that contain lots and lots of really cool custom content, and a large number of fun folks who help make up the online UT2004 community. Then just below that is the ‘Filters’ option. 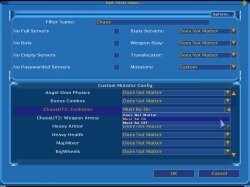 If you wish you can click there to create a custom Chaos filter which will sort through all of the servers out there and display for you only those which are currently running the Chaos mutator. To create the Chaos filter, use the ‘Mutators’ drop down menu and select ‘Custom’. Then in the bottom section use the ChaosUT2: Evolution drop down menu and select ‘Must be On’. Be sure to give it a name (ie: Chaos), then click ‘Ok’. This will create a Chaos filter for you that you can easily turn on or off at will. 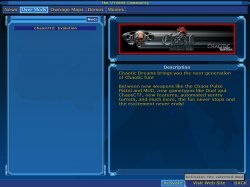 However, if you first activate the Chaos mod, there is a custom Chaos browser available. 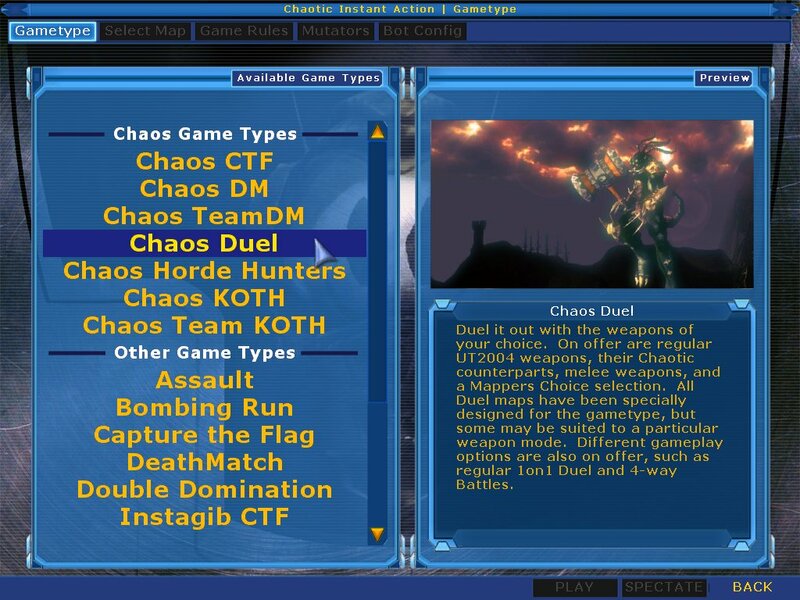 You can either search by specific Chaos game type, or you can select ‘All Chaos Games’ to find them all at once ( this ‘All Chaos Games’ option will not detect Chaos servers running versions older than 3.7 ).